YELLOW STAIR RAILS, HANDRAILS & KICKPLATES AVAILABLE UPON REQUEST AT NO EXTRA CHARGE. Install one of these modularly designed, moderately priced pre-engineered mezzanines and youll double your floor space. Completely fabricated steel components are ready to assemble without drilling or welding. Heavy-duty, high capacity 5" x 5" x 3/16" columns are strong enough to meet your industrial and commercial needs. Designed for 125 PSF live load and 8' clear height. Please submit approval drawings for all orders showing size and height of mezzanine, type of decking, length and number of framing members, column locations, and location and type of accessories. FOB WISCONSIN. 16 standard sizes. Column spacing is 11' x 15'11-1/4" for typical plan. Moisture-resistant resin board is 3/4" tongue and groove. Bar grating is 1" x 1-1/8". These mezzanines are applicable for seismic zones 1 & 2. For other zones call for information. Call for pricing on sizes not shown. SPECIFY: A - Roof deck and resin board, B - Bar grating. Custom-Size Mezzanines. We specialize in custom-design mezzanines. Contact our technical dept. 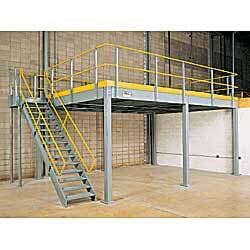 for complete assistance for any mezzanine application. CLOSED TREAD & OPEN RISER. Mezzanine level personnel can access one pallet bay while a lift truck operator at level below is accessing the other. Interconnected sliding gate opens and closes each 5' x 5' bay. Yellow stair rail, hand rail, and kickplate available upon request at no additional cost. *Above dimensions are nominal. Exact dimensions may vary ±1". *Closed tread and closed riser available, call for information. Tilt gate also available, call for information.